Indian Village: In 1898, just after the second annual Frontier Days rodeo, the CFD committee invited American Indian performers to participate in the CFD celebration. American Indian performers have returned to CFD each year since. Seven performances a day. Behind the Chutes Tours: See the hidden side of rodeo. These exciting tours follow the path of the bulls and broncs as the animals are rounded up and threaded through the maze of gates on their way to the chutes and out into the arena with cowboy in tow. Cowboy Church: The service on each Sunday will be held by Susie McEntire and her husband Mark Eaton or Fellowship of Christian Cowboys. Both are a multi-denominational Cowboy Church Services. Chuckwagon Cookoffs: View and visit with authentic chuckwagon crews as they give a glimpse into life on the Goodnight Trail more than 100 years ago. Crews are given a standard set of ingredients, then judged on not only the wide range of foods produced, but also on wagon, tools, and campsite. The public may sample the wares. Food goes fast, so be there early! Ft. D.A. Russell Days: From the first days of Army cavalry, through several transitions to modern–day Air Force Intercontinental Ballistic Missiles, the military has played an important role in every CFD celebration. That tradition carries on with the F. E. Warren Air Force Base open house called Fort D.A. Russell Days. USAF Thunderbirds: The jets race the skies only a few feet from wingtip to wingtip, and the crowd gets a glimpse of the awesome skills and capabilities that all fighter pilots must possess. Show is Wednesday only. Grand Parades: People from all over the world take in the sights and sounds of some of the top marching bands and horse-drawn vehicles in the country! 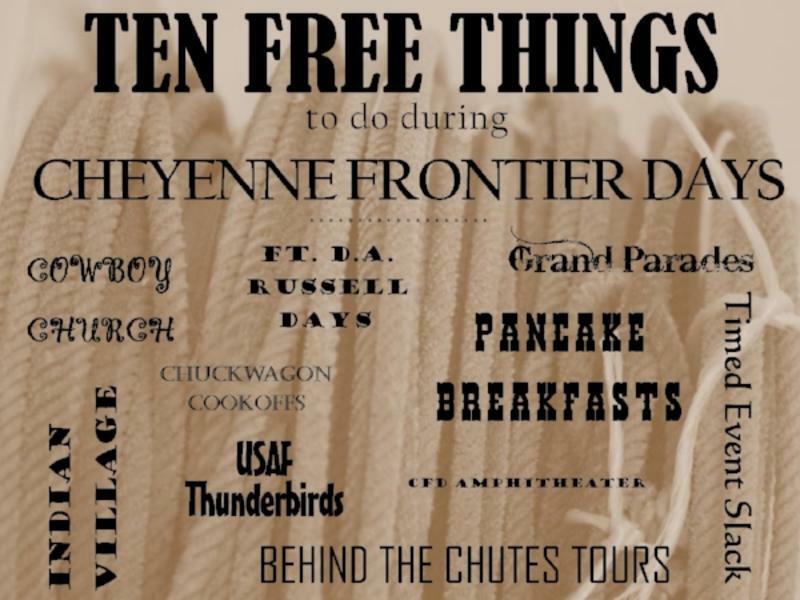 Pancake Breakfasts: Beginning at 7 a.m. on Monday, Wednesday, and Friday, enjoy a free breakfast in downtown Cheyenne with visitors from all 50 states and many foreign countries. You might help set a record! Timed Events Slack: With so many contestants to have their turn, the only way to make it work is to give everyone rodeo performances and slack performances. This is the way to whittle down contestants toward the finals rodeo, which is on the last Sunday. Old Frontier Town: Michael Martin Murphy & Friends will perform at the Sidewinder Saloon in Old Frontier Town every day from 10 a.m.-noon and 4-7 p.m.